Today's announcement outside the former Y on upper Washington St. is being celebrated by those who were part of the original plan to directly benefit from a $3 million giveback in exchange for a bigger and denser Hoboken Hilton downtown. Over the last few days, word of the three million proposed allocations left many angered for being ignored altogether in the non-transparent process and or scrambling to be included. 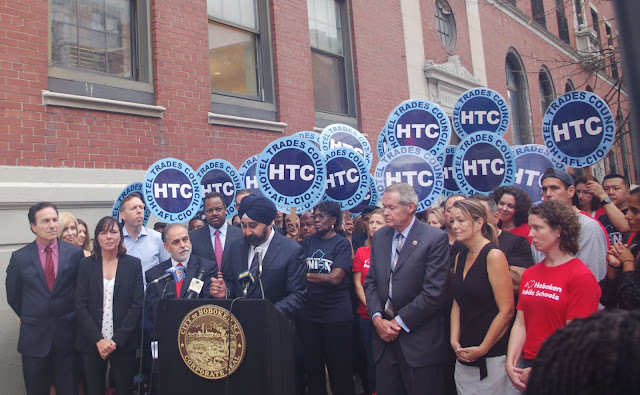 The initial restructured $3 million in community givebacks, two toward a revamped community center and another million for the Hoboken school district set off a firestorm among Mile Square non-profits and others. Details of how these seven-figure funds will be utilized are unclear at the moment. There doesn't appear to be any business plan or model detailing how the monies will be utilized. Overnight, the community benefits have suddenly mushroomed to over $4 million with the charter schools and local infrastructure getting a taste. The full details and how this is intended to work awaits complete release and review. Yesterday, the Hudson County View covered the emerging firestorm when word began hitting the streets over the weekend and reported the pressure mounting from the public through the City Council subcommittee. The subcommittee members continue that KMS should contribute an additional $75,000 towards a feasibility study for the Hoboken Community Center as soon as construction begins on the hotel, currently projected for early 2019, as opposed to after the project is completed. Talking Ed Note: How and why another million materialized almost literally overnight says much about the lack of transparency in this process and the political ambition in controlling it. The City Council is familiar with this behavior out of the mayor's office but the wider Hoboken community just got a taste.